The Chicken Tikka and Rice Self Heating Main Meal from Beyond the Beaten Track is a delicious, hearty meal which requires no stove to heat it up. 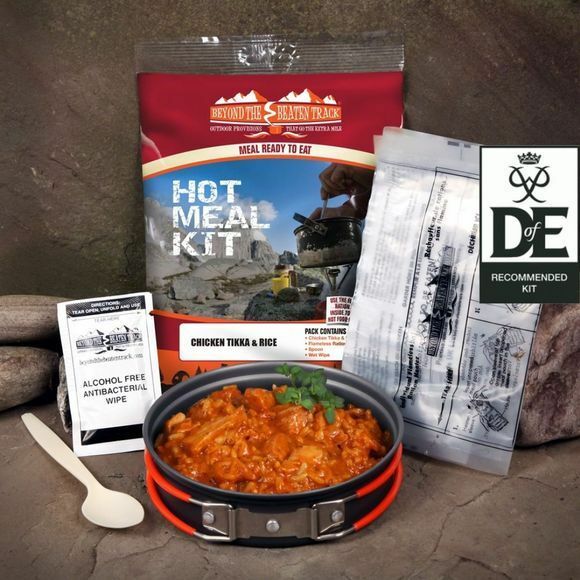 This is a real adventurer's pack, consisting of a main meal, spoon, wet-wipe and a flameless ration heater: eat anytime, anywhere! Perfect for using in remote locations, on expeditions, or even outdoor music festivals where stove fuel may not be permitted. The flameless heater is very easy and safe to use: simply place the sealed meal in with the heater, add a small amount of water, and a chemical reaction produces heat to warm through your dinner! Cooked chicken breast (19%) (chicken, salt), cooked long grain rice (18%), water, tomatoes (14%), double cream (8%), chick peas (8%), tomato puree, maize starch, onion, creamed coconut, rapeseed oil, sugar, tikka masala paste (rapeseed oil, water, salt, concentrated tomato puree, turmeric, cumin, tamarind pulp, paprika, garlic powder, maize flour, lemon juice, coconut cream powder, spices, herbs, acetic acid, emulsifier: soya lecithin; citric acid, lactic acid), coriander, wheat flour, garlic puree, ginger puree, salt, spices, chilli puree, colour: paprika extract; concentrated lemon juice.